WASHINGTON—In an effort to highlight their longstanding contributions and loyalty to the agency, the U.S. 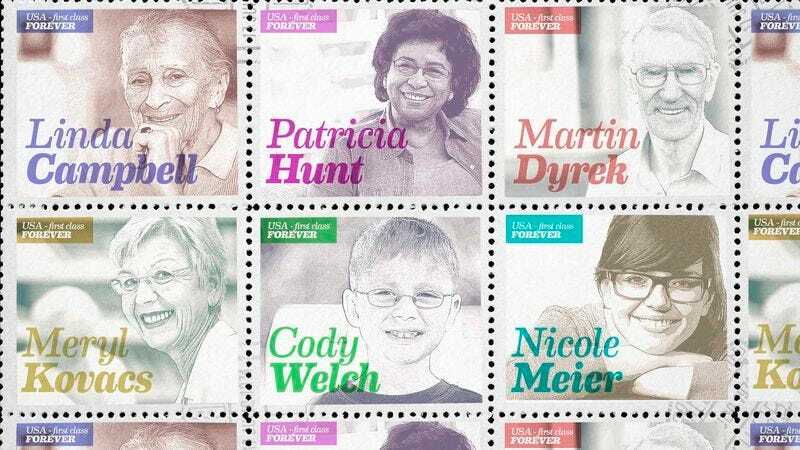 Postal Service unveiled a new line of commemorative stamps Wednesday honoring those Americans who still use the U.S. Postal Service. “Our latest series of Forever stamps recognizes the remaining citizens who continue to support the USPS by physically sending their bills, rent checks, and thank-you cards via traditional mail,” said Postmaster General Patrick R. Donahoe, noting that the newly issued stamps will depict such longtime supporters as Linda Campbell, an elderly Charleston, SC resident who still writes letters to her loved ones regularly, and 24-year-old Nicole Meier, who sends postcards during various trips around the country using the national mailing system. “The efforts of these individuals—including Salem, OR resident Patricia Hunt, who mails a birthday card to her nephew each year, and the sixth-grade teacher at Nyack, NY’s Humphrey Elementary School, who still has students send letters to their state senators every fall—are worthy of our praise and deserve the highest honor the USPS can bestow.” Donahoe added that the Postal Service would also be releasing a limited edition collector’s stamp honoring those who have purchased a booklet of stamps, later lost it, and then had to buy another one.